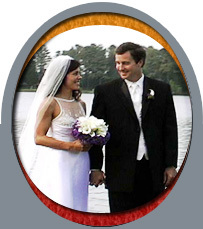 "I can't thank you enough for your thoughtfulness in sending me the video of Rebekah & Patrick's wedding and reception. I rarely get a chance to see the finished products, such as videos or photographs. You both do an outstanding job as well as being highly professional. I was talking with the father of the bride on the phone last night, he said they were extremely pleased with the outcome of the video and after reviewing it, I'd definitely agree. I look forward to working with you very soon, and I would highly recommend your services." "Thank you for sending me a copy of the Truitt's wedding video. I took the time to review it and will have to say how impressed I was with the quality of the visual and audio. What a timeless gift for the brides to watch their wedding day unfold right before their eyes!" "Jim & Millie - having worked many,many times with videographers during weddings, I can say without hesitation that your finished product has the quality, creativity, style and professionalism the like of which I have never seen. It put others' similar ventures simply to shame. I was just about floored by it! In this trade, it is with these elements, these ingredients mentioned above, that one rises to his or her community's tip-top of reputation. You both have surpassed my previous thoughts on what a quality wedding video could be! "Well done" is an understatement. Keep up the great work, and I very much look forward to working with you again soon." "We watched our video a few nights ago and it was absolutely perfect! You captured everything and more than we ever expected. It was like reliving the day again. It went by so quickly for us and we forgot so many things that happened during the day. Thanks so much for putting it all back together for us. We appreciated all your hard work and great personalities. You were both super to work with. Thanks again for everything. We will certainly spread the word about your perfect work." "You did a fabulous job capturing our wedding day! We had a ball watching our video. You did a much better job than other videographers we have seen capturing everything before, during and after the wedding. Thank you so much." "We have watched the video several times and Chuck tells everyone, â€œIf you want to smile for a straight hour and a half, just watch the videoâ€�. We will highly recommend your company. Itâ€™s the best wedding video we have seen." "The quality was excellent, the lighting was perfect. Voices were clear and pictures non static. The cover was extremely excellent. I like your style compared to other videos I have seen and would ensure future couples they are getting the best." "Having our wedding videoed was a positive experience. We were both comfortable with you and your cameras. The video was excellent. It was interesting, fun to watch, and well captured. This video was the best we have seen. We shopped around for videographers and you were the best by far. We will definitely recommend you to our friends." "This was the best investment I have ever made. Everything was great!" "We were extremely pleased and comfortable with you and your cameras. You showed exceptional service and examplarary professionalism. A+ Video is the appropriate name for your company. Words cannot express how we love the tape and the cover is JUST!" "Thank you so much for that wonderful video. Weâ€™ve never seen a video quite like that one before. The animation and highlights were great. We were so pleased with the outcome. You do a wonderful job! God bless you always." "Thank you so very much for the fantastic job you did in taking the video of Kristy & Jerryâ€™s wedding day. The final product was absolutely superb and deserves an Academy Award for film production. You definitely have a gift and talent. I was so glad you were part of making Kristyâ€™s and Jerryâ€™s day perfect! Thanks for capturing it so exquisitely!" "Jason and I would like to personally thank you for sharing in our day. You two did a wonderful job. I am beyond pleased with our video. It was even better than I expected. Iâ€™ve watched it four times already. I cry every time. We have a wonderful keepsake weâ€™ll treasure forever thanks to you!"